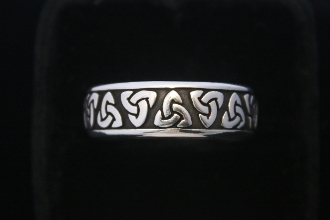 Our Products >> KNOTWORK BAND RINGS >> "Trinity Band Ring small"
Wonderful women's 5mm band ring in the classic trinity design. This is part of a new matching set for men and women, and I still need a new photo, but this is a very clean repeating trinity ring in a symmetrical band. I also have a very hearty men's version of this ring in stock, with a more elaborate explanation of this design in the "ring" category.